It is not just a cleansing oil, but the combination of natural black grains. Ingredients extracted from the nature will gently take care of your skin. Black Bean Oil Black bean helps to control the sebum production, increases the skin elasticity and provides a soothing effect. Black Sesame Oil Black sesame prevents dehydration and skin aging while providing powerful antioxidant effects through various useful components such as Beta-carotene, Rinolenic acid, Sesamin, Sesaminol and Tocopherol. Black Currant Seed Oil Black Current Seed Oil strengthens the skins protective layer to prevent the evaporation of moisture from the skin. It promotes skin cell regeneration and provides antioxidant effects by containing various minerals. Explore the entire range of Cleanser available on Nykaa. 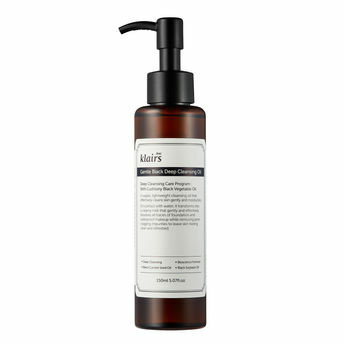 Shop more Klairs products here.You can browse through the complete world of Klairs Cleanser .